This delicious looking dish has been provided by Bord Bia and looks just right in advance of all things Patriotic and Green. We are headed for an exciting and eventful few weeks with St Patrick’s Day followed very quickly by numerous commemoration events all around the country for the 1916 rising (click that events link for info). For those, like myself, of a limited attention span here’s a link to a ‘blow by blow’ guide to the Easter rising – a bit of a bluffer’s guide for those of us who haven’t studied history. Okay, enough with the historic and back to the food. 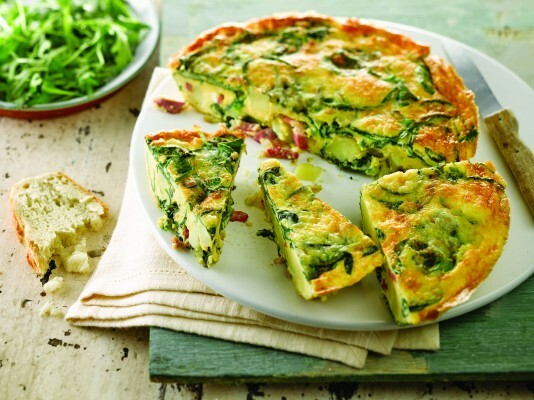 Using Irish eggs, bacon and ham, potatoes, cheese, spinach (or you could use kale) I would encourage you to use Irish rapeseed oil in the cooking of this meal to celebrate a simple, delicious, Irish meal with the best of Irish ingredients. The recipe here says 2 large potatoes peeled and cooked – that would mean boiling until tender – I would cheat on this and use 10 or so baby Irish potatoes, unpeeled, sprinkled with water and microwaved until tender – 6 to 8 minutes – depending on how many you put in the microwave and its wattage so check after 5 minutes. I would use them thickly sliced keeping their skins on for added fibre. Heat a little oil in a medium, non-stick frying pan (approx. 24 cm). Add the onion and bacon and cook for about 5 minutes over a medium heat. Cut the potatoes into cubes about 1 cm thick. Add a little more oil to the pan then add in the potatoes. Allow to cook for another 5 minutes, stirring frequently. Stir through about half the spinach. In a bowl beat the eggs, then stir in half the cheese, the rest of the spinach and a little salt and black pepper. Slice into wedges and serve with a green salad and bread.